In spite of recent fearmongering by Germany and New Democracy leader Antonis Samaras, polls still show Syriza (radical left) leader Alexis Tsipras in the lead for Greek Prime Minister. 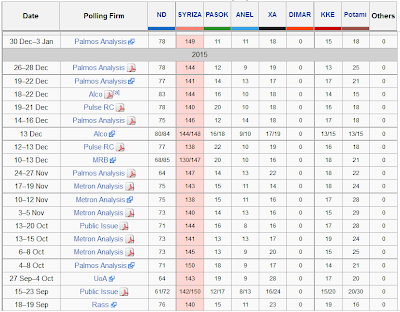 Syriza's lead has generally been shrinking, but all of the polls have Syriza in the lead. Polls are pretty volatile. Leads swing from 3 to 10 points depending on polling organization. 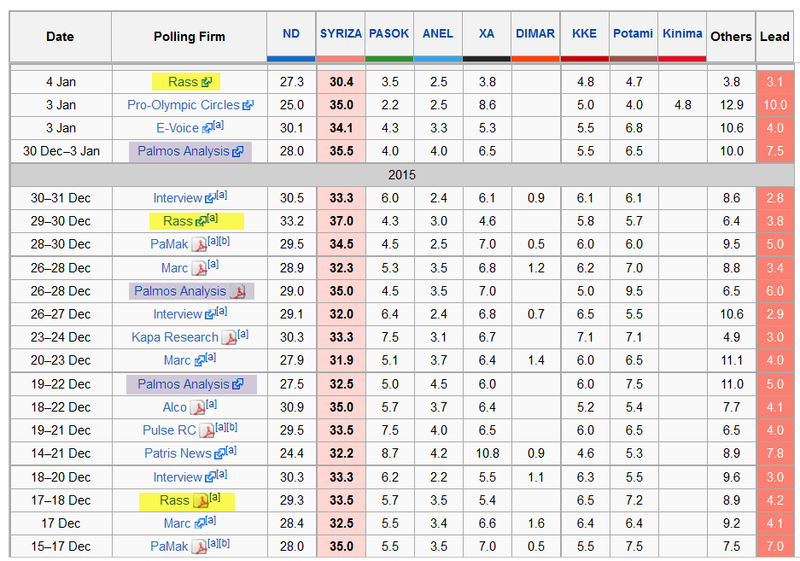 Wikipedia has a nice summary of the Greek Election on January 25. 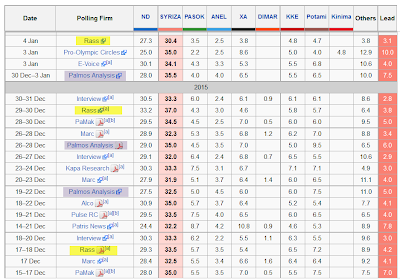 I highlighted three polls by Rass and three by Palmos Analysis. The former all seem on the low sided in respective time groups and the latter on the high side. There is certainly a difference between a 3 point lead and a 10 point lead. But the important factor is all the polls are in agreement. Unless and until that changes, the odds for Syriza are likely better than the polls indicate. 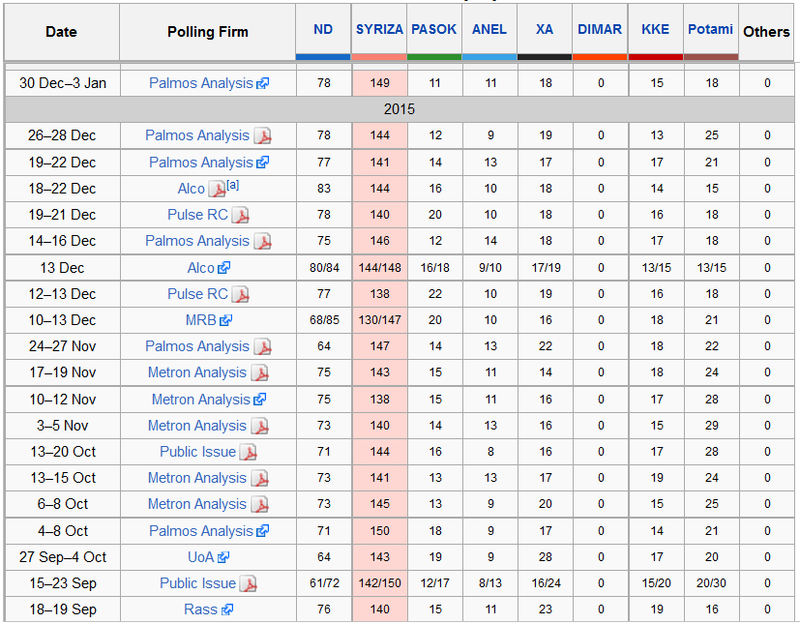 Note the huge disproportionate seat total for Syriza over New Democracy. Greek election law gives 50 seats to the party that receives the most votes in the general election. Small parties need to reach an electoral threshold of 3% in order to be represented in parliament. It takes 151 votes to reach a majority. If the smaller parties are bumped off it may be impossible for Syriza to form a coalition government should it fall short of a 151 seat majority. In an effort to prevent Syriza from gaining enough seats (or perhaps out of political arrogance), former Greek prime minister, George Papandreou, revealed plans on January 2 for a new political party, the Movement of Democratic Socialists. This purportedly will take leftist votes from Syriza. But it may also ring the death bell Papandreou's former party Pasok, currently only polling 2.2-4.3% in the four most recent polls. Syriza: Coalition of the Radical Left: a left-wing political party in Greece, originally founded as a coalition of left-wing and radical left parties. The coalition originally comprised a broad array of groups (thirteen in total) and independent politicians, including democratic socialists, left-wing populist and green left groups, as well as Maoist, Trotskyist, eurocommunist but also eurosceptic components. ND: New Democracy: The party's ideology was defined as "radical liberalism," a term defined by New Democracy as "the prevalence of free market rules with the decisive intervention of the state in favour of social justice." Pasok: Panhellenic Socialist Movement: A democratic socialist party founded by Andreas Papandreou in September 1974. In 1981, Pasok became Greece's first left-of-centre party to win a majority in the Hellenic Parliament. XA: Golden Dawn: Scholars and media have described Golden Dawn as neo-Nazi and fascist though the group rejects these labels. Members have expressed admiration of the former Greek dictator Ioannis Metaxas of the 4th of August Regime (1936–1941). They have also made use of Nazi symbolism, and have praised figures of Nazi Germany in the past. According to academic sources, the group is racist and xenophobic. The party's leader has openly identified it as nationalist and racist. Dimar: Democratic Left: a social-democratic political party in Greece that splintered when various leaders left or were kicked out of the party for failing to vote for austerity measures. KKE: Communist Party of Greece: A Marxist-Leninist political party in Greece. It was Founded on 17 November 1918 as the Socialist Labour Party of Greece. It is the oldest party in the Greek political scene. Potami: The River: The party was launched on 11 March 2014, by TV presenter Stavros Theodorakis. The party has been described by the media as pro-European, inspired by social democracy and liberalism and relying heavily on Theodorakis' personal popularity to attract voters. Kinima: Movement of Democratic Socialists: A new centre-left political party announced on 2 January 2015 by George Papandreou, current President of the Socialist International, outgoing Member of the Hellenic Parliament and former Prime Minister of Greece. Pasok officials immediately denounced Papandreou's move as an "unethical and irrational political act" which they said to be aimed at fracturing Pasok and motivated by personal ambition rather than any "real" political disagreement. One might think Syriza could easily find coalition partners among all those socialist possibilities, but that's not the case. Syriza wants to restructure the bailout and end the austerity. Interestingly, that was the position of various opposition parties until they formed a government. Once in power, they all started dancing to the tune of the Troika polka. Golden Dawn is a genuine anti-euro possibility but a radical left and radical right group will not work out so well as partners. Could such a weird coalition form if only for a brief while for Greece to make demands on Germany? I don't know the answer to that, but politics does make strange bedfellows as we have seen with the US handling of ISIS. Suppose New Democracy wins by a very tiny margin with 85 seats outright and say another 50 simply for getting the most votes. Could Samaras pull together 15 more votes to form a coalition? If so, how fragile will it be? The same question applies to Syriza. What kind of deals will it take to form a coalition if Syriza is a few votes short? If no one can form a coalition, or a coalition quickly breaks apart, more elections will be needed to decide. That's a distinct possibility with this motley group. If you were looking for a reason over 70% of Greeks want to stay with the euro, take a look at the political parties who have been looting the country. Still, what cannot be paid back, won't. I also seldom agree with Eurointelligence and Financial Times writer Wolfgang Münchau. Today I do. Here are a few paragraphs from his recent column Political extremists may be the eurozone’s saviours that I endorse 100%. The official EU policy towards Greece is best described as debt forbearance — of recognising a debt problem, and delaying the inevitable. It is also the policy of Antonis Samaras, the Greek prime minister, and his coalition government. It is a version of extend-and-pretend: extend the loans, and pretend that you are solvent. The history of international debt crises tells us that these strategies are always tried, and always fail. Unfortunately, the only party that makes a convincing case for a debt restructuring is Syriza, a party of the radical left. While Syriza is right about debt restructuring, it is also disingenuous by ruling out a eurozone exit. If you advocate debt restructuring, you would need to answer the question of what you would do if the negotiations fail. The choices then would be either to revert to the status quo — in which case there would be no point in voting for Syriza — or leave the eurozone, and unilaterally default against foreign creditors. But this is precisely what Syriza has ruled out. Syriza has the right instincts, but may not have the right policies. Such lack of consistency matters because Angela Merkel in particular appears willing to call Syriza’s bluff. Der Spiegel reported over the weekend that the German chancellor is willing to risk a Greek exit if its next prime minister were to abandon the current policies. In other words: the only way for Greece to restructure its debt would be to leave the eurozone. My preferred indicator for the continuing eurozone depression is not the rate of unemployment, but the rate of employment. The former does not capture the large number of disheartened people who have simply dropped out of the labour market altogether. The Spanish employment rate fell from 66 per cent of the employment-age population to 56 per cent between 2007 and 2014. In Greece that number is below 50 per cent. With existing policies, Spain and Greece have no chance of reverting to normal levels of economic activity within a generation. Debt is what holds back Greek and Spanish growth. The Spanish private sector needs a debt restructuring as badly as the Greek public sector. As in Greece, only a political party of the hard left — Podemos — offers a policy of debt restructuring. In both countries, there is now a sufficiently strong body of public opinion to realise that without a debt restructuring there can be no recovery in output and employment. This is why radical parties are succeeding. If something is unsustainable, it will end — or so the saying goes. Based on present policies, the eurozone is unsustainable, at least with its current borders. I see no way out for Greece without a debt restructuring. And I don’t see a debt restructuring inside the eurozone. I fail to understand how this setup of political extremists "saves the eurozone" as the headline implies, nor did Münchau explain. However, I am in tune with his general message as well as his prediction "The probability of at least one political upset in 2015 is very high indeed"
For further discussion and analysis, please see Competing Views: Grexit Would Be "Lehman Squared" vs. No Problem; Where to Point the Finger When it Blows. The pot is simmering and is likely to boil over at any time. When it does boil over, Greece will not really be to blame, even if Alexis Tsipras wins the election and carries out his threats. Rather, be prepared to point the finger at the EU, ECB, and IMF for their collective insistence that Greece, Spain, Italy, etc. repay debt that cannot and will not be paid back. By the way, there is a small chance Tsipras wins the election and Greece exits the eurozone with limited initial fallout. If so, the major problem will come when Spain or Italy does the same thing. With that, it appears Münchau and I are singing the same tune.